That Beladonna book offer reminds me that I've never tried to hawk my copy from the original sale. Not that I think there's any chance of actually selling it at those absurd amazon marketplace prices or anything. I also recall Jeremy (I think) saying they would consider selling the remaining stock of their Kyoani artbooks for titles like Violet Evergarden, etc, if it wasn't required to be given back. Anyone know what the situation there ended up being? I know the AL team don't publically frequent the forums much these days, but I figure it's worth enquiring about nonetheless. 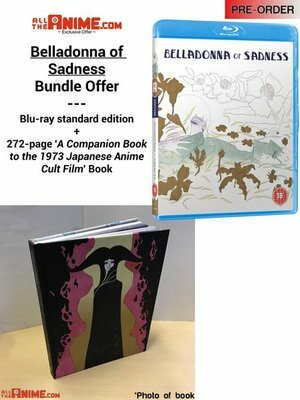 "NOTE: This is a Limited Edition product currently exclusive to AllTheAnime.com and Zavvi.com. " This will be available on zavvi also (with book)? Damn, very bad time for me. I really want to get this book, but I can't currently. Probably this will not be available later time? Your Giovanni's Island Ultimate Edition's in that sale for £20, @ayase. I don't know many of these titles and I own the ones I do, so I have no clue if I might be missing out on any bargains here frankly. Comes with the Yoko Kanno soundtrack too! Weird they are putting it at the near same price as their new CE though. Looks really nice but I need to be certain they actually manages to make the release have at least decent picture quality and that the replacement for part 1 to also have at least decent picture quality. Especially now the discs are being replaced, there are people who probably didn't buy it because of that who'd now be interested. I've ordered part 2 but will wait for the disks on part 1 to be fixed before ordering. Like thedoctor2016 said its a shame there's no offer on part 1.